Although the rather remarkable HTC One scooped up awards all over the shop when it was released last year, it failed to send cash tills ringing in the way the company had hoped – so now they’re back with the all-new HTC One M8. The M8 promises to be bigger and better than its predecessor, starting with its all metal-clad body which manages to improve on the gorgeous looks of the original. It looks stunning. 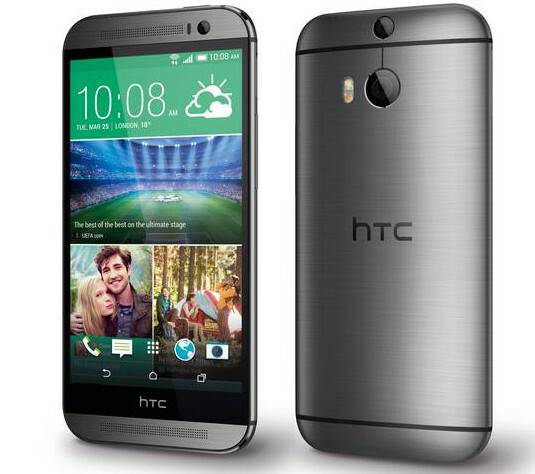 The new HTC One M8 is a fairly sizeable thing, measuring 146.36 x 70.6 x 9.35mm and weighing 160g, and is slightly larger than One, with the twin speakers at the top and bottom making it taller than rivals like the Galaxy S5. The phone should still easy enough to hold for most folks, and anyone who’s heard the sound that those speakers can knock out may be convinced the size increase is worth it. Powered by a Qualcomm Snapdragon 801, quad-core CPU clocked at 2.3GHz (there will also be a 2.5GHz version in Asia), there’s 2GB of RAM and 16GB/32GB of internal storage onboard, along with – huzzah! – a microSD slot offering expansion up to 128GB. The five inch display is protected by Corning Gorilla Glass 3 a and supports a 1920 x 1080 pixel resolution, giving a pin sharp 441ppi. There’s a new version of HTC Sense running on top of Android 4.4, which adds a few tweaks to the original – read more on Pocketlint: HTC Sense 6.0 vs Sense 5.5: Tweaks and changes reviewed. 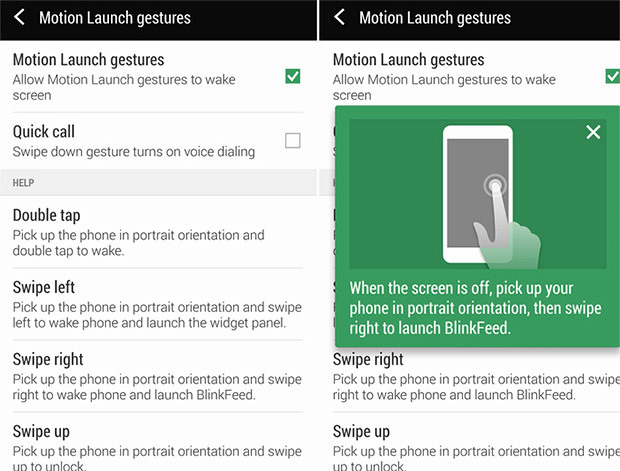 A neat new feature is Motion Launch gestures, which lets you tap and swipe the phone to access features without pressing the power button. There’s also a fast launch for the camera using the volume button,which will swiftly fire up the camera from standby – a feature we like the sound of very much indeed. HTC have put a lot of work into improving the camera, with the Duo Camera able to to capture depth information, so you can change the the point of focus in a shot after taking it. Unfortunately, it’s the same UltraPixel arrangement as its predecessor, so the resolution steadfastly sticks to megapixel resolution which limits the ability to digitally zoom in and crop images. The twin-tone flash should produce less ghastly images than most current phones, and you can manually focus, set the white balance, ISO or shutter speed, giving photographers more control. The battery has been beefed up to a 2600mAh number giving a projected talk time of 20 hours and standby of 496 hours, and there’s also a low power sensor onboard with motion controls, so the phone can be used with the pre-installed FitBit app as a pedometer. 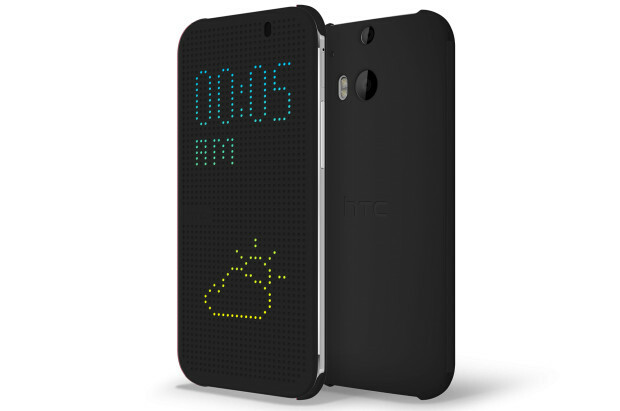 We like the clever case which gives a dot matrix read out when tapped and offers all sort of other neat tricks. 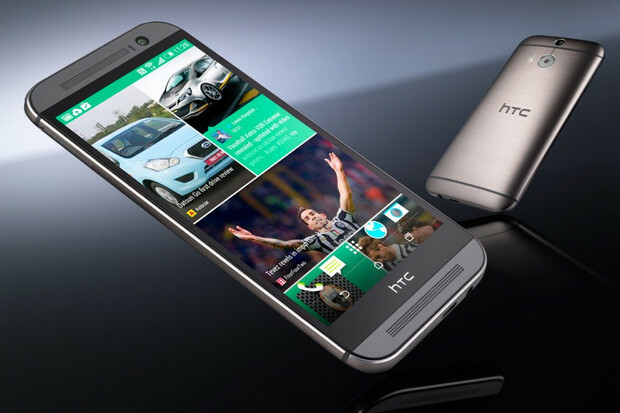 In many ways, the HTC One M8 looks a far more exciting proposition than Samsung’s S5. It’s certainly has more striking looks, and the clever camera features may prove a compelling feature – the hard bit may be persuading the public not to go with the big name clout of Samsung and try something a little different.